Click on the topics below to go directly to them. Sportschool Tim Kool offers a variety of sports. Despite our website is in Dutch almost all of our teachers speak English. We already have (had) students from England, Scotland, Italy, Indonesia, Russia and Spain. Everybody gets two free trail lessons to start with. Don’t hesitate to contact us through our contact page. Hereunder you will find some information about our sports. Don’t hesitate to contact us through our contact page for more detailed information. Taekwon-Do is our main sport. It’s a Korean self defence martial art that follows the tennets: Courtesy, Integrity, Perseverance, Self-control, Indomitable Spirit. Everybody is welcome from the age of 6. It doesn’t matter is you want to do competitions or if you just want to do the sport on a recreational level. Everything is possible. 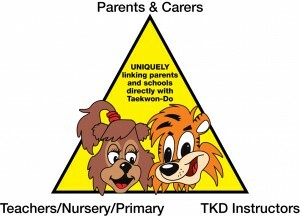 Our TKD Kubz programme is a specially designed class for children aged between 3 and 8 years of age. The programme heavily rewards what is most important, effort and attitude over physical ability! All our Instructors are fully insured, PVG checked and trained to the highest level in the TKD Kubz Martial Arts programme. They are patient, well-mannered, kind and trustworthy individuals who always put the kids safety first and foremost in every class. If you want to combine most of the fitness sports, then TOUGH Workout is for you. It’s a circuit training with different exercises every time. There are three different kinds of rounds possible. One is a 3 rounds circuit training with each exercise lasts 30 seconds. Seconds is a 2 round of 1 minute and the third a single round of 2 minute per exercise. This all combined with some pumping music. Once every quarter there will be a progression lesson. Every member will get a card with 10 exercises on it. This way you can compare the progression lessons and see if you have made progress. Some think Kickboxing is too brutal. Some said Taekwon-Do is too soft. Semi-contact Kickboxing at Sportschool Tim Kool is the combination of both. The speed and agility of Taekwon-Do combined with the toughness of Kickboxing. The teachers have a Taekwon-Do background of a full contact Kickboxing background. This way the best of both will be taught at our students. Try it yourself. You will love it. Some people like to sport in the evening and other in the morning. MorningFIT provides training similar to TOUGH Workout, but with different rounds and times. This way you will start your day with a great workout! You will feel so much more energized during the day. Also very important is that after each training session there will be a nice cup of coffee waiting at the bar. Book your free trail lessons now! Fill in the contact form below or call to 06-37 39 57 82. We will give you all the information you need and book your free trail lessons right away.